Ernie Szelesi was born in 1930 with only one hand, which had just two bumps for fingers, and no hand -- only a stump -- on the other arm. 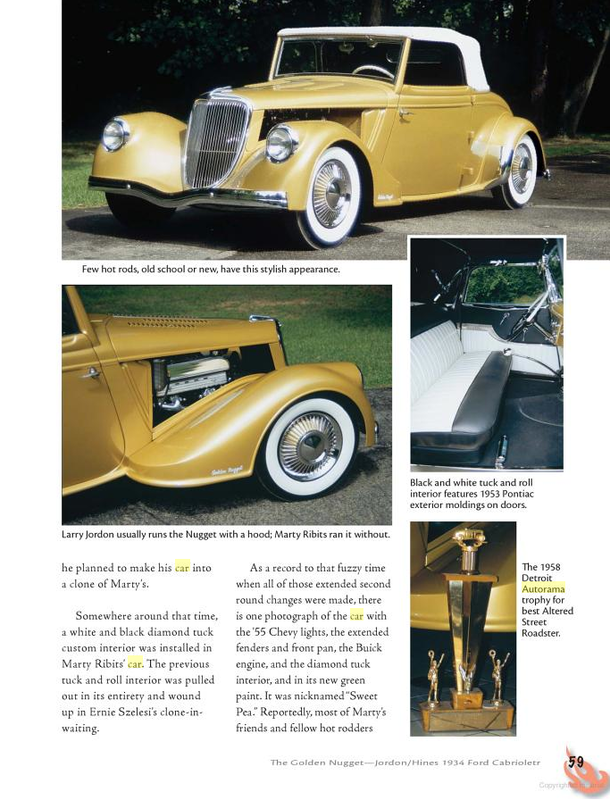 At age 14, Ernie bought the original rusty old '33 Ford from a junkyard for $25. 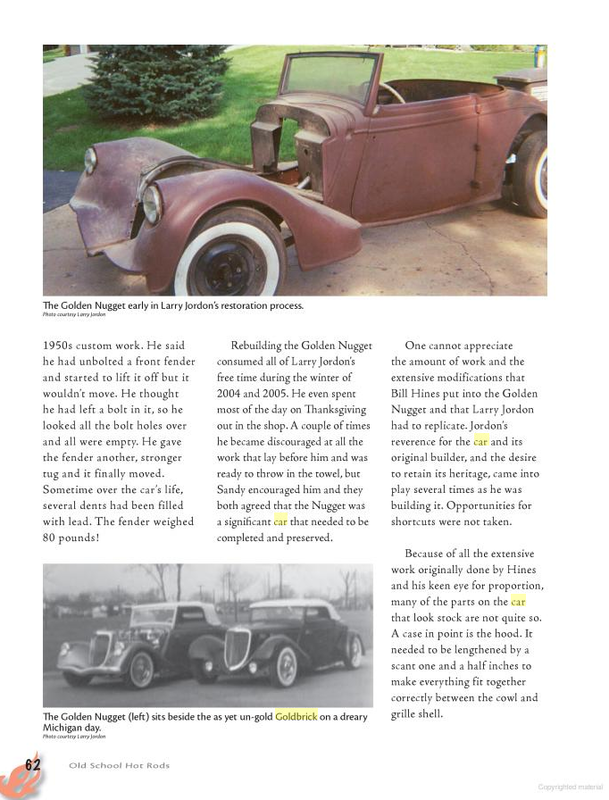 Despite his birth handicap, he did all the body work and painting on the car, all the engine work, everything himself. Szelesi's car was originally painted black. He drag raced it a lot, both on dirt and on pavement. His wife said he was always doing something to it, always changing it somewhere. In the late 1950s, Ernie stopped racing and decided to start showing the car. He repainted it gold, with a little gold dust in the paint to make it glitter or shimmer. 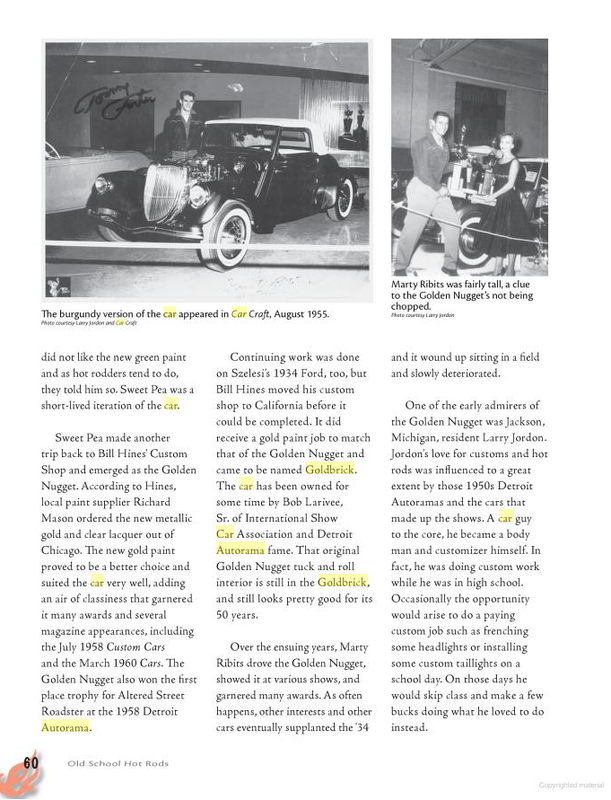 The Goldbrick was the first roadster to win the Detroit Autorama's Best of Show Award. Ernie and Barbara met in 1951, and were married in 1954. They had a son, John, and a daughter, Vicki. Ernie intended to keep his '33 cabriolet show car so that he and John could work on it and do things with it together. Barbara described Ernie as about 5'7” tall and weighing no more than 135 lbs. ​ The new owner was a retired policeman named Tom, who lived not too far North in the town of Lake Orion. Unfortunately, within a year of buying the car, Tom lost his life to cancer. 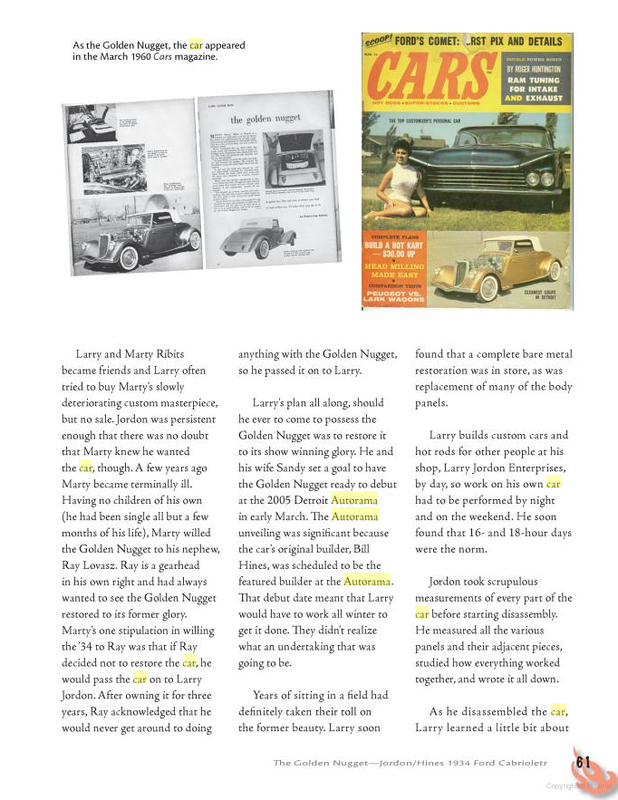 His family then sold the car to Bob Larivee. Bob tried persistently over the years to purchase the many trophies Ernie had won over the years with the Goldbrick, but Ernie refused. Finally, Ernie concluded the awards were only going to continue decaying away down in their basement, so he agreed to sell them all except for a small handful. Son John has the Detroit Autorama Best of Show Trophy from 1958, and their daughter has the small wooden trophy from Ernie's first drag racing victory. Ernie passed away with cancer in 2001. 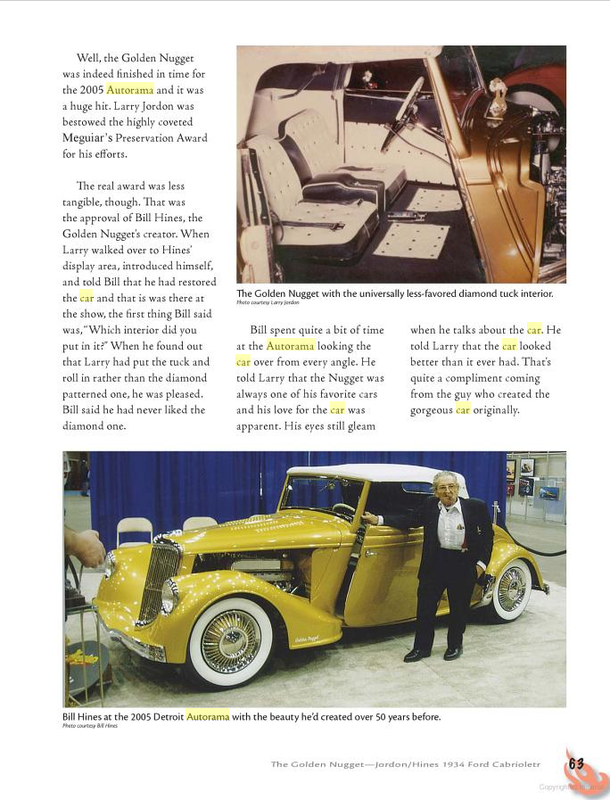 Mrs. Szelesi recalls helping Ernie clean and polish the Goldbrick before each car show. All the fins in the car's hubcaps are individually attached with screws. Ernie would take them all off and Barbara would sit in their living room floor and hand polish each fin, sometimes well into the early morning hours. She did not especially enjoy that job.